Finally! After almost two years, our Mysore Clock Vine (Thunbergia Mysorensis) rewarded us with its first bloom, ever. I say rewarded, because we knew it will take a long while before this plant bears flowers, if at all. And I must say the wait was worth it. The Mysore Clock Vine, also known as Lady's Slippers, Doll Shoes and Brick and Butter, among others, is known to flourish in the highlands of Tagaytay or Baguio, but not in the lowlands. I could almost assume that it's the cool weather in those two cities that makes it favorable for the Mysore Clock Vine to flower. Can you believe our Mysore Clock Vine started from small cuttings? This was way back in April of 2009 when we joined a Visita Iglesia Tour to Batangas. After visiting 4 churches (out of 7), the tour bus stopped at a roadside restaurant called Cafe Casa Rap. The place had a huge garden with so many flowering plants. But the one flowering plant that caught everybody's attention was the Mysore Clock Vine. Of course we didn't know the vine's name at that time. The vine grew freely on an overhead arbor and it provided shade for a big part of the restaurant. The flower clusters were simply amazing and DH was already itching to get a few cuttings. She managed to get only one, discretely, of course. Another place where DH managed to get another cutting was at our seventh and last church stop. This was at the Caleruega church grounds in Tagaytay. Again, the whole place was brimming with flowering plants. I didn't see the Mysore Clock Vine there but DH had the eye for it and was able to get one cutting. I was so surprised that DH managed to get BOTH cuttings to grow! And after almost two years, the Mysore Clock Vine bloomed. Of course we no longer know which particular vine it came from. Here's DH proudly showing the first ever flower cluster (raceme) of the Mysore Clock Vine (Thunbergia Mysorensis). 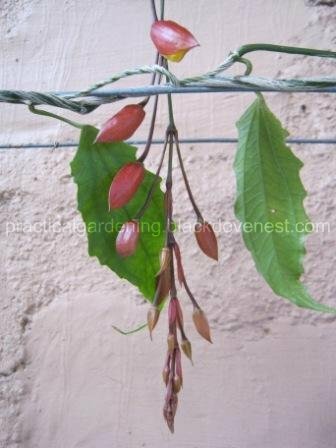 From pictures gleaned from the internet, I found that the Mysore Clock Vine loves to climb trellises, arbors, pergolas and other climbing supports. It can easily cover a big surface as it's an aggressive vine. The trellis I built for it and the Millionaire's Vine was getting too small for both these vines that I had to cut and remove the Millionaire's Vine. But that too wasn't enough. 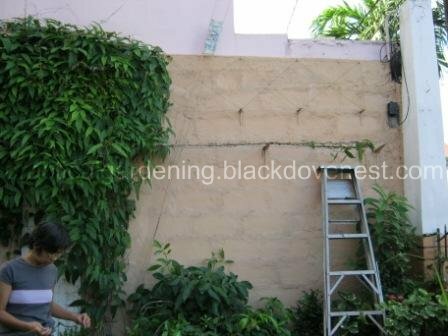 Soon the long shoots of the robust vine even reached and climbed a posts guy wires as well as our dangling telephone wires at the corner of the garden wall. This posed a bit of danger when the typhoons come. The strong winds beat down heavily on the vines. But with the vines tendrils clinging to the cables and wires, the wires get pulled from their attachments. With so much foliage and aggressive climbing branches, I try to prune the vine once or twice a year. Shown below is the recent pruning I did on the Mysore Clock Vine. I pruned heavily the right side of the vine where the guy wires and telephone wires are located. Notice the telephone box at the right side of the photo has been moved. It used to be positioned below the present location. It was damaged and a telephone crew came to re-position it. Because of the dense foliage, I always get a big dump of leaves and branches whenever I prune the Mysore Clock Vine. At its present stage of maturity, I'm hoping it will continue to flower even as I continue pruning the branches to limit its growth and prevent the vine from climbing the posts. UPDATE: Here's our Mysore Clock Vine in its full bloom. You mentioned it growing under a conifer tree. Does it get any sunlight at all? My vine yielded flowers during the 1st and 2nd quarters of the year when it had direct sunlight in the mornings. Is it cool at your location? I've observed that Mysore clock vines bloom in high-altitude areas where it is cooler. I'm almost sure that Genting would have these vines flowering profusely year-round. Im living in d lowlands of malaysia.. D only time dat it's slightly cooler us after a rain or in d morning.. It gets filtered sunlight n d base if d stem us ard 1.5 inches.. Ita growing in abt a 12 inch pot though.. Wonder wars d prob here.. Maybe I hv to wait for it to climb right to d top n get more sunlight.. I believe in phillipines it has better chances of blooming due to d rich volcanic soil..
We roughly have the same conditions. I actually live in the city, in the lowlands also. Try getting it some sunlight. Other than that, I suppose you just have to be patient. Ok thanks.. Are you using rich organic or humus soil and any special fertilizers? Nothing special. We actually have clayish soil, so I mix in aged cow/horse manure and compost. It's a mature plant (almost 3 years). Once a week, I add a little ammonium phosphate. Hi has it rebloomed ever since? Good question. Yes, it flowered again on its third year. Sadly, there were only 2 blooms for that whole summer! We had to take it down from the trellis because it's so invasive yet with only sparse blooms for all its foliage. It needed too much and too frequent trimming to keep it tidy. i bought 3 potted plants with blooms. Unfortunately due to the shock of relocation to a new environment, the buds didnt develop fully and all dropped. Based on my research online, the Thunbergia family likes to be root/pot bound in order to bloom better. Thus, in order for it to rebloom, i will not repot them but continue to fertilize them in the same pot. i have been so obssessed with this vine but i cannot find it anywhere here in tarlac.. where are u located? Anonymous - I've never seen these sold, especially in pots, especially with blooms! I only see them flower in gardens or in the wild where they are grown in the ground. Also, the only ones I see blooming are those that are already big. mauidoll - Ah... obsession obsession. I won't be surprised if you won't find it there. I'm guessing that folks in the lowlands don't bother to grow it as it rarely blooms in their locations. I'm in Muntinlupa City and managed to get plenty of cuttings in Tagaytay where it's so much cooler. I think you'll have better luck in Baguio or Nueva Ecija. Tip: Garden resorts and restaurants (or even church gardens!) are good spots to hunt for these vines. Getting them to grow is one thing. Getting them to flower is another. Good luck. I see. Are you saying you have removed your plant completely? You should try growing them in a pot to see how it goes. The peduncle sure is very fragile. Its hard to imagine that it will develop into a raceme. Yes, it was a maintenance issue for me. That's interesting, Anonymous. How much did you buy the Mysore vine per pot? Where did you buy them? I bought them from Sungai Buloh Nursery, the most famous plant nursery area in Malaysia. They were imported from Thailand. It costed me rm 50 per pot. hello blackdove! can you post latest picture of your mysore clock vine? how's your mysorevine now? is it continue to flower in muntinlupa? i live in bicol region (sorsogon). i bought my vine at orchidarium in baguio city near burnham park. i want to hear from you soon about this vine. Hi Robert. I decided to get rid most of the vine a few years ago. Here's my post on that update. I have a small vine at the backyard which I keep short. Mam i speak tagalog na lang po. Hirap po ako mag english. :) sa loob ng 2 years dalawang bulaklak lang? Baka need lang po ng new location para makakuha sya ng full sun. Balak ko gumawa ng pergola sa kabilang side ng house para makakuha ng full sun ang vine ko. Obssees kasi talaga ako sa vine na to. Baka hindi lang nakuha ang light requirement para magbloom ng marami.im sure kulang lang sa sun light yan. Or baka need ng fertilizer para magbloom ng marami. Robert, space is what I don't have. A pergola like what you're planning would be an ideal home for the vine. Maintenance and constant pruning is a big factor I had to consider because of our limited space. If you have the space in the pergola, then go ahead. The beautiful flowers are worth the patience. Here's my post on my flowering mysore vine. Ano kaya ang dahilan bakit ang konti magbulaklak at parang seasonal lang? Or baka malamig kasi sa baguio? Tagaytay? Or lagi nyo binabawasan kaya hindi nyo makita ang ineexpect nyo na bloom? Or need more sunlight? Bakit kaya? Sayang naman konti lang magbulaklak. Sana dito makita ko ang full bloom nito. 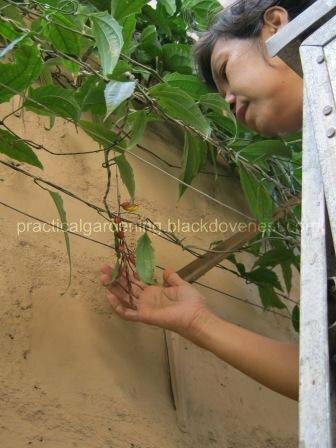 Isa din sa pinaka magandang vine ay wisteria. Yes, the vine flourishes in high temperature regions because of the higher elevation. This is also observed in other southeast asian countries where there are plentiful mysore vines in places that are counterparts of Baguio and Tagaytay (ex. Cameroon and Genting Highlands in Malaysia). If you like something similar to the wisteria, you could try planting the Sandpaper Vine (Petrea volubilis) - sometimes called the Tropical Wisteria. It's what I planted to replace the mysore vine. It is not as invasive or aggressive as the Mysore vine when mature. It's already tall and I'm hoping for it to flower soon. Pwede po makahingi ng link ng sandpaper vine nyo? I have here also thunbergia grandiflora and rangoon creeper and also yellow vine. Hindi ako nagagandahan masyado sa yellow vine. I haven't written any posts yet on the sandpaper vines. I just bought a couple of these plants last year. You could google the sandpaper to find how it looks like. The grandiflora, like the mysorensis are both aggressive and invasive. I also got rid of my T.grandiflora for these reasons. Where did you bought your sandpaper vine? Just like wisteria. Di bale kahit konti lang bulaklak ng mysore mag aantay pa rin ako dahil sa obssession ko sa vine na to. Ito na pinaka magandang vine ang nakita ko. I bought the sandpaper vine in Los Banos, Laguna. I was able to propagate it but was successful with one cutting so far. Even when established, I consider it a medium-grower - not aggressive. The vine is around 10 feet long already. I hope so to reward me plenty of blooms. When is the season of sandpaper vine? I hope to see in your blog soon. Sana may nabibili din dito sandpaper. Try ko maghanap. Meron siguro pero bihira. How is it? Madali buhayin? I've not seen a live sandpaper vine with flowers, so I don't know when they bloom. I've only seen the flowering ones in photos. It looks quite hardy and no pests. When young, it is very slow-growing. But when it reaches around 5 ft., then it becomes a medium grower. Ang paglago ng sandpaper parang garlic vine. Once become stable madali na ang paglaki. Magsulat din ako ng blog if mapabloom ko ng marami yung mysore ko. Do send me a link if you create a blog. Good luck on the Mysore vine. Kamusta na po mysore nyo? Totally niremove nyo na po? Sa araw araw na lumilipas pabilis ng pabilis humaba mysore ko. At sobra dami na tumutubo. Yes, I've removed it from the trellis. I still have a mature Mysore vine at the back, but without a trellis. I'm keeping it very short - maybe 5 ft. tall. Sabi nung iba na napagtanungan ko mysore flourishes din sa lowland basta fully establish na daw. Totally niremove nyo na yung vine? I got some wisteria seeds galing america. Yes, it was removed because my dog dug up the roots of the Mysore vine. Did you buy your wisteria seeds? You might be interested also in the Sandpaper vine, sometimes called the Asian Wisteria. Mine has grown big already. I invite you to read my blog entry on the Sandpaper vine. Here's the link to my article on the sandpaper vine. It's how to grow a single trunk on the sandpaper vine. Hi Robert. Why is your account named Doms? Anyway, the Sandpaper vine's trunk has thickened but it has not yet flowered. Maybe in the dry season next year. Hi good day! I'm a 4th year BSChemistry student and Im working on my undergraduate thesis regarding the medicinal propeties of thunbegia mysorensis. I am wondering if this plant is still alive because i need the leaves of the said plant for my experiment. Hoping for your reply. Thank you. Hello Halleah. Yes, I still have a vine at the back which is kept trimmed and short. Where are you from and where do you study?